The PURESTREAM, INC. package sewage treatment plant is an Extended Aeration treatment system. 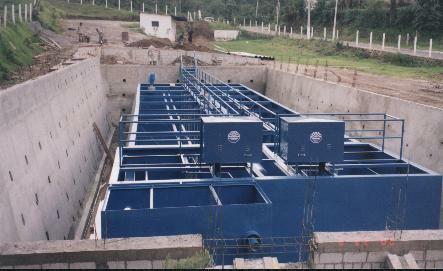 This treatment system works by providing ideal conditions for aerobic bacteria and other micro-organisms; these micro-organisms then decompose the biological contaminants in the raw sewage. The treatment plant provides the proper environment, sufficient oxygen and other elements which allow the bacteria to consume the organic matter and to live and multiply within the treatment plant. In this way the aerobic bacteria and microbes decompose the sewage and waste to a stable form - odor and nuisance free. The package sewage treatment plant is used to fill the gap between individual septic type systems and large municipal plants. They are used to provide sewage treatment for subdivisions, mobile home parks, schools, recreational parks, nursing homes,factories and other commercial businesses in outlying areas without municipal sewer facilities.